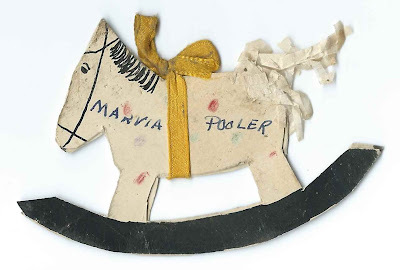 Rocking horse memento designed by hand for Marvia Mae Pooler of Old Town, Maine. 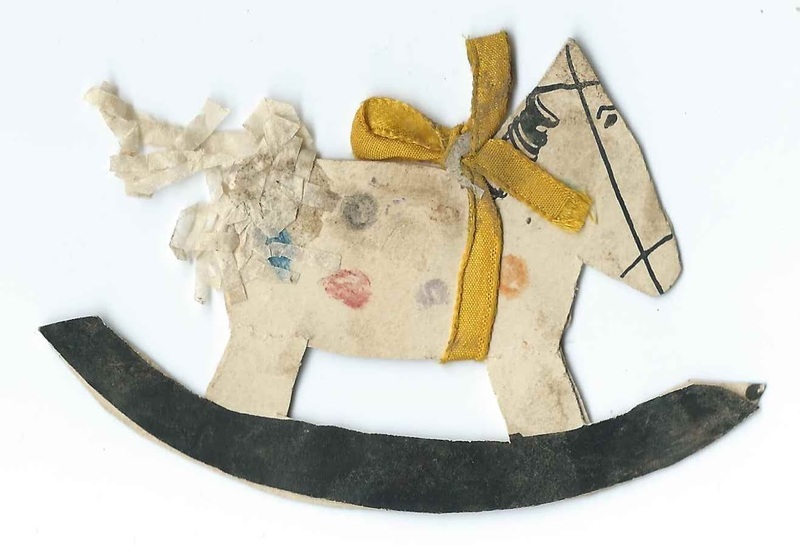 Approximately 4" by nearly 2-1/2" and constructed of two pieces of card stock tied together with a ribbon. Marvia Mae Pooler was born in 1910 at Old Town, Maine, the daughter of Arthur Edward Pooler and Zora G. (Yerxa) Pooler. Arthur was born at Old Town, Maine. Zora's birth record indicates she was born at St. Stephen, New Brunswick, and she indicated Canada as her place of birth on census forms. However, her marriage record indicates her birthplace as Stacyville, Maine, and she did have at least one sibling born there. Marvia graduated from the University of Maine in 1933. It appears that her family had moved to Bucksport, Maine at some point, and Marvia joined them there. In 1934 while living at Bucksport, she married Stephen Ayrault Barry, a Connecticut native who was then living at Thomaston, Maine. Marvia and Stephen presumably met at the University of Maine, from which Stephen graduated in 1931 with a degree in mechanical engineering. The 1940 Census of Bucksport, Maine, shows Marvia and Stephen living with Marvia's parents. Stephen was working as a mechanical engineer at a paper mill. He later became plant engineer. The couple had one child, born in 1943. Stephen died in 1980; read his obituary here. Marvia died in 1996. They're buried in the Lawndale Cemetery at Old Town, Maine, with Marvia's family members. If you have corrections and/or additions to the information above, please leave a comment or contact me directly. Please be careful about revealing details about living people.